Mediaplanet announces its new 'Coffee Culture in America' campaign found within the San Francisco Chronicle and online, out today! This campaign serves as an educational guidebook for everyday coffee drinkers, highlighting how the coffee industry has adapted to consumer demands and trends for sustainability, transparency, convenience and quality. 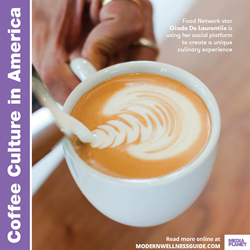 Mediaplanet today announces the launch of “Coffee Culture in America” published as a centerfold insert within the San Francisco Chronicle and is featured online. According to a survey from the National Coffee Association, Americans consume 400 million cups of coffee per day, equivalent to 146 billion cups of coffee per year, making the United States the leading consumer of coffee in the world. This campaign serves as an educational guidebook for everyday coffee drinkers, highlighting how the coffee industry has adapted to consumer demands and trends for sustainability, transparency, convenience and quality. In an interview, Food Network celebrity chef and restaurateur Giada De Laurentiis expressed how important quality ingredients, a strong digital presence and connecting with customers are for building brand recognition and generating long-time success, especially in the foodservice industry. When selecting which coffee to serve at her Las Vegas restaurant, Pronto, De Laurentiis went through “weeks of tasting sessions before landing on the perfect organic blend” that customers enjoy with her Lemon Ricotta cookies — the recipe is available on her lifestyle platform Giadzy.com. Much like her coffee, the star wanted to create an organic dialogue with her audience and customers through the Giadzy platform. The site has been a key ingredient to De Laurentiis’ successful career outside of her Food Network ventures. With this, she’s been able to create a brand that anyone from loyal fans to food lovers looking for a fresh recipe can look to for tips on anything from coffee to dinner to entertainment for the whole family. The print component of “Coffee Culture in America” is distributed within today’s edition of the San Francisco Chronicle, with a circulation of approximately 163,000 copies and an estimated readership of 550,000. The digital component is distributed nationally, through a vast social media strategy, and across a network of top news sites and partner outlets. To explore the digital version of the campaign, click here. The campaign also covers topics such as what it’s like to be a professional barista, how to improve the home coffee experience, the rise of third wave coffee, transparency in the supply chain, and how to be a green consumer. Additionally, coffee manufacturer Club Coffee offers an inside look on how their compostable single-serve coffee pods are the green solution to tackle the rise in waste from plastic single serve pods. A study by the National Coffee Association shows 63 percent of coffee drinkers own a drip machine and 41 percent own a single cup machine. The plastic coffee pods consumers are probably most familiar with are incredibly difficult to recycle. “It tastes great but is not so good for the environment.” Says Dr. Calvin Lakhan, research scientist with Canada’s largest waste research project “The Waste Wiki Project” at York University in Toronto. Club Coffee created PῧrPod100™, the first single serve pod to be certified compostable in commercial facilities by the Biodegradable Products Institute and approved by the Compost Manufacturing Alliance, representing major U.S. composters.